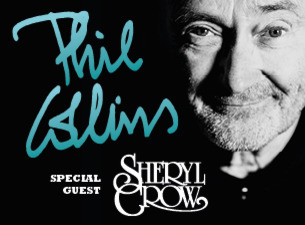 Stockholm Globe Arena, Sweden - concerts and entertainment. You can not miss The Ericsson Globe arena. Like a giant golf ball is clearly visible in Stockholm. Every year you can experience big events here as example. The Swedish Melody festival, the Swedis Athletics Gala, and of course the biggest stars as they tour the world. In 1985 the city of Stockholm launched a design competition for the upcoming arena and those who won were the Stockholm-based company Berg Arkitektkontor. The Stockholm Globe is the world's largest spherical building. 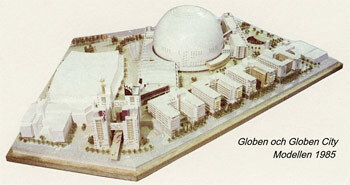 On September 10, 1986 they began building it and on February 19, 1989 about 2.5 years later, the Globe was completed. The unique shape quickly made it become a symbol of Stockholm and Sweden. 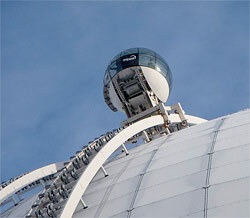 For those of you who do not have fear of heights maybe a tour on the Globe SkyView might be an idea. The SkyView is a 100 m long gondola lift which takes you along the Globe's wall up to the top (about 130 m above sea level). Up here you have a fantastic view over Stockholm. You go in a spherical gondola with walls of glass so that you can see 365 degrees in all directions when you're up on the top. 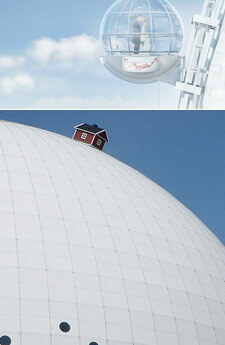 The idea for SkyView began back in 2004 as to attract more visitors to the Globe arena and tourists to Stockholm. In 2010 SkyView opened. The vessel / cabin is about 4.5 meters in diameter and takes a maximum of 16 people per trip. The journey up and down takes about 20 minutes. TheSkyView ride is said to be unique in the world. A Stockholm Pass is filled we free entrances to a lot of different things in Stockholm such as lots of museums as the Vasa museum, Skansen, the Royal Palace and a free ride on the SkyView. A good card to have during your stay in Stockholm. The volume inside the globe is approximately 600,000 m3. If a tap would try to fill the Globe with water, it would take up to 40 years. If you want a slightly different wedding with butterflies in the stomach, a marriage in a SkyView-gondola can be an option. Best suited for a civil ceremony because of the travel time in the gondola. But even customized wedding can be arranged. In 2009 a little red cottage were placed on top of the arena. Hotel tip near the Stockholm Globe Arena! Nov 2012 © www.ilovestockholm.se - I Love Stockholm a tourist guide to the city of Stockholm.